WASHINGTON (Feb. 05, 2008) -- The Army's budget request went forward to Congress Feb. 4 as part of President George W. Bush's fiscal 2009 budget. The request includes funding for an across-the-board pay raise of 3.4 percent and money to increase the service's end strength by 43,000 Soldiers. The request for the Department of Defense base budget this year exceeded $515 billion, including some $140.7 billion for the Army -- an increase of about $11.8 billion over what Congress enacted for the service in 2008. 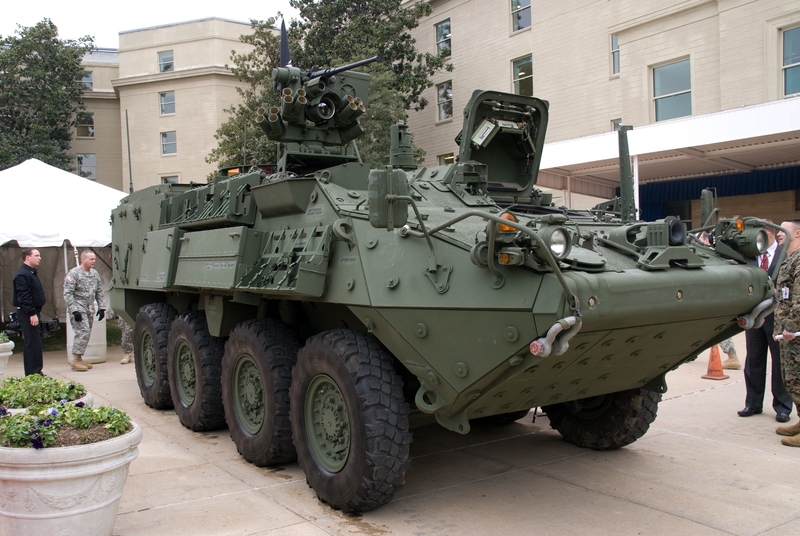 As part of its fiscal 2009 budget request, released Feb. 4, the Army hopes to purchase additional Stryker nuclear, biological and chemical reconnaissance vehicles, like the one displayed Dec. 17, at the Pentagon. The Stryker NBCRV is an NBC testing lab on wheels. It is intended as a replacement for the Fox NBC Reconnaissance System. Included in that budget is about $51 billion for military personnel expenses, $40.2 billion for operations and maintenance spending, and $24.6 billion for procurement. The Army's $51.8 billion request for military personnel funding represents a sizable increase over last year's request. That stems mainly from in increase in end-strength of about 43,000 Soldiers for a total of about 532,400 by the end of fiscal 2009. In past years, funding for those extra Soldiers has been included in the supplemental budget request. Also part of the personnel budget is an increase in National Guard end-strength of about 1,300, an across-the-board pay raise of about 3.4 percent and funding for other incentive programs. Many incentive programs to support recruiting and retention, however, will be included in the supplemental budget request, said Lt. Gen. David Melcher, the military deputy for budget to the assistant secretary of the Army for Financial Management and Comptroller. "This budget supports many of the incentives that support the all-volunteer force, (including) the pay raise, although I will tell you that not all incentives for recruiting and retention are contained in the base (budget)," he said. "A pretty sizable amount of incentives are in the supplemental funding, attributable to the fact that in this particular period of time, given the stresses we are under, we are having to pay a little bit more incentives to folks to come in and retain." Army operations and maintenance funding in the 2009 budget request comes in at about $40 billion. That funding supports recruiting and training, maintenance of equipment, and quality of life initiatives such as child care, youth programs and community services, Melcher said. "These are some real increases in the amount of operations and maintenance funding available to the Army. Some of the things these accounts are doing is supporting the readiness of the forces and our combined arms training strategy," he said. "They support ten rotations at the National Training Center, ten rotations at the Joint Readiness Training Center, 8 rotations at the Joint Multinational Readiness Center and also fund our battle command training program. Also rolled in the account is funding for base operations and support." The general said the greatest preponderance of the Army's operations and maintenance funding will be in the supplemental budget. The Army has asked for about $24.6 billion for procurement funding in fiscal 2009. Included in that is about $6 billion for tactical and support vehicles, $5 billion for new aircraft, $5.3 billion for communications and electronics, and $3.6 billion for weapons and tracked vehicles. Some of the funding for aircraft has come from termination of the Comanche program, Melcher said, adding the Army has tried to keep those funds in the budget. In the fiscal 2009 budget, the Army funds about 28 Army reconnaissance helicopters to replace the ageing HH-58D Kiowa Warrior helicopter, 63 UH-60M/HH60-M Black Hawk helicopters, seven C-27J Joint Cargo Aircraft, 32 AH-64 Apache helicopter upgrades and conversions, and 36 UH-72A Lakota Light Utility Helicopters. The service will also pay for the conversion of 23 CH-47D Chinook helicopters into F models and will also buy an additional 16 new Chinooks. "There's a lot of money in here for Army aviation, which is of course needed and appreciated," Melcher said. The Army has also wants to fund 108 Patriot Advanced Capability-3 missiles and two additional battalions of Patriot-3 to give the Army a total of 15. "This gives us a sustainable rotational base upon which to implement our Army force generation model," Melcher said. The fiscal 2009 budget request includes $3.9 billion for weapons and tracked combat vehicle funding. That includes about $330 million in Future Combat Systems procurement -- a difference from past years where most FCS funding was for research, development, testing and evaluation, Melcher said. "This is one of the things you begin to see in the '09 budget," he said. "Whereas FCS was previously mostly an RDT&E venture -- and there is still about $3.3 billion in RDT&E -- this year you begin to see about $330 million in procurement, which is principally oriented to the Non-Line-of-Sight Cannon and also some spinout we are looking to procure in order to test -- first at Fort Bliss with the evaluation task force we have forming down there, and then later to go into units." Additional weapons and tracked combat vehicle funding is aimed at Strykers -- including mobile gun systems for Strykers -- and the nuclear, biological and chemical reconnaissance vehicle. The Army also hopes to procure Abrams system enhancements and 21 additional M-2A3 Bradley vehicles. In fiscal 2009, the Army will pay for an additional 5,000 Humvees, night vision devices, thermal weapons sights and funding for the Warfighter Information Network - Tactical. One of the largest increases in the Army's budget request is funding for facilities. The total Army facilities funding request amounts to about $11.3 billion. That money covers about $5.4 billion for military construction, $1.3 billion for Army family housing and $4.5 billion for construction related to Base Realignment and Closure. "If you add that all up, it's really a pretty big year," Melcher said. "This is a big year for the Army, because we are trying to meet the BRAC timeline and get it done by fiscal 2011. We also have a pretty sizable plus-up to military construction -- a lot of that attributable to `Grow the Army.'" The general also said the Army is on track with housing privatization and expects to privatize some 2,400 housing units in fiscal 2009. "That brings the Army to about 86,000 homes that will have been privatized by the end of fiscal 2009," he said. "On balance, it has been a real success story for the Army and we are giving a better quality of life to Soldiers and families living in these quarters."